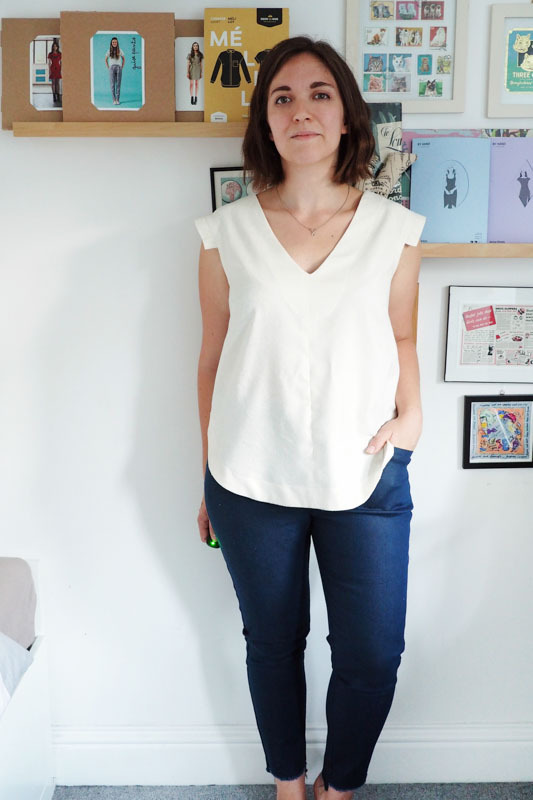 This is the Dove blouse, the new pattern from Megan Nielsen, which she kindly sent me a pre-release of to try out. It’s a very pretty semi-fitted top with a host of yummy design details like French bust darts, chunky topstitched facings for the V-neck and curvy hem, and a slew of sleeve options, from slim elbow-length to fabulous full-on bell. Being me and unable to leave a good pattern alone, I eschewed all the sleeve options, instead adding little rectangular caps and finishing the rest of the armsyce with bias facing. 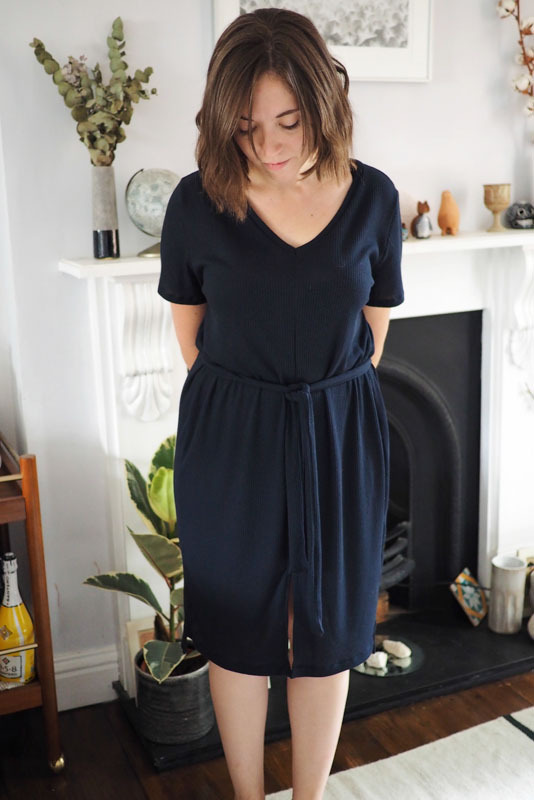 I’ve come to realise that any woven garment with a set-in sleeve rarely gets reached for in my wardrobe unless the drafting is 100% spot-on, plus I’m always overly warm rather than cold so it isn’t actually all that seaosnally-inappropriate. I’ll do a tutorial for the hack if anyone’s interested. 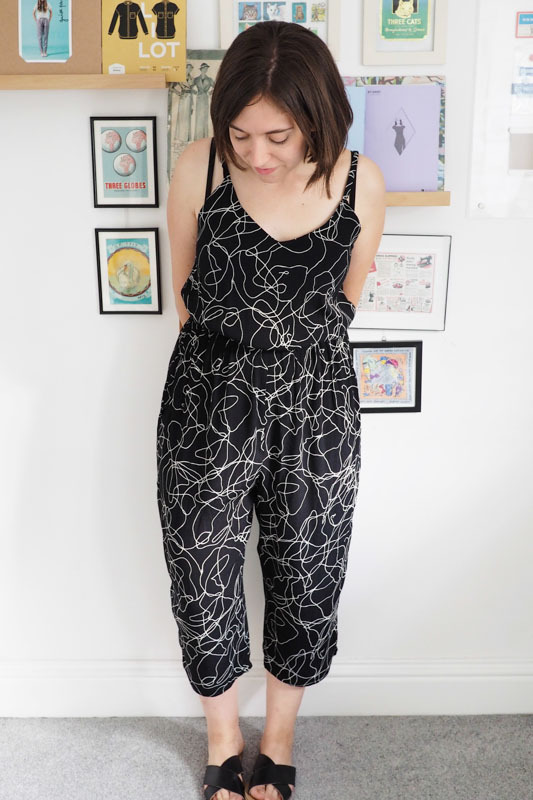 As usual from Megan’s patterns, the instructions are clear and well-illustrated, and the drafting is just a delight – this was so pleasurable to sew and all came together in a few hours. 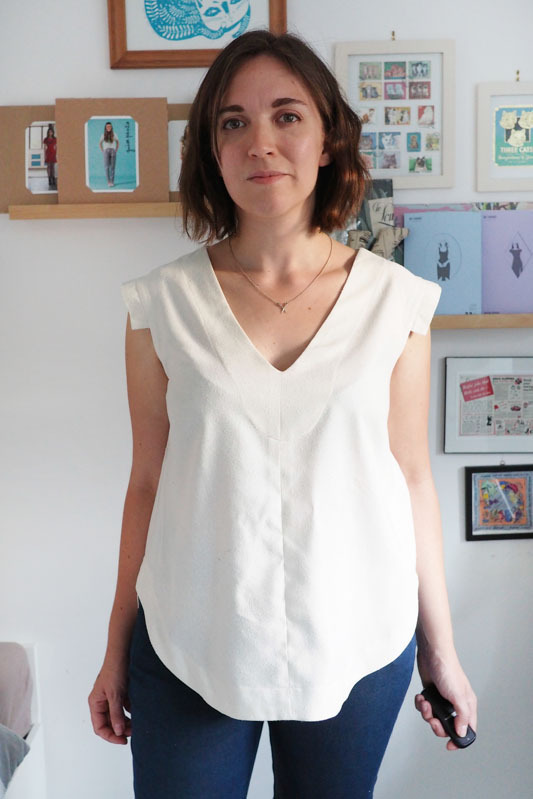 I cut a Large, which is bigger than my measurements but I like a lot of ease in woven tops. It still fits really nicely around the neck and shoulders, though it dips a bit too long in the back for my preference – I’ll take some length out next time. Self-bias faced armholes and the faced, topstitched neckline. 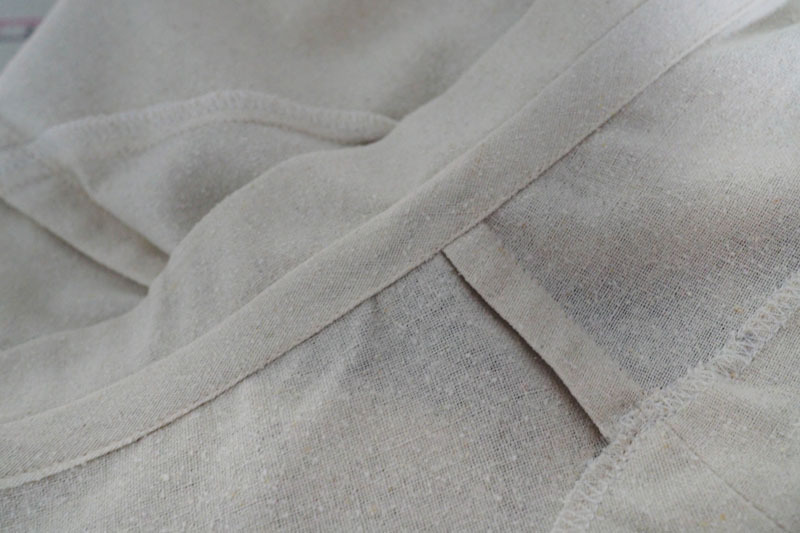 The hem facing and centre-front seam. 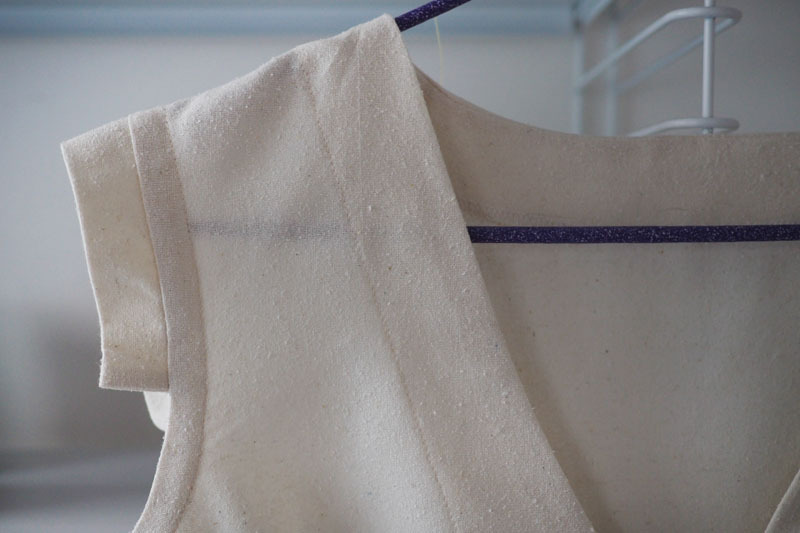 French-seamed shoulder seam and French bust dart in the background, the ‘legs’ of which are cut out, so raw edges are overlocked after it’s sewn together. The rather directional design details, not to mention the colour, feel a little ‘out there’ for my usual/current style, but I do love it and expect it will get lots of wear. 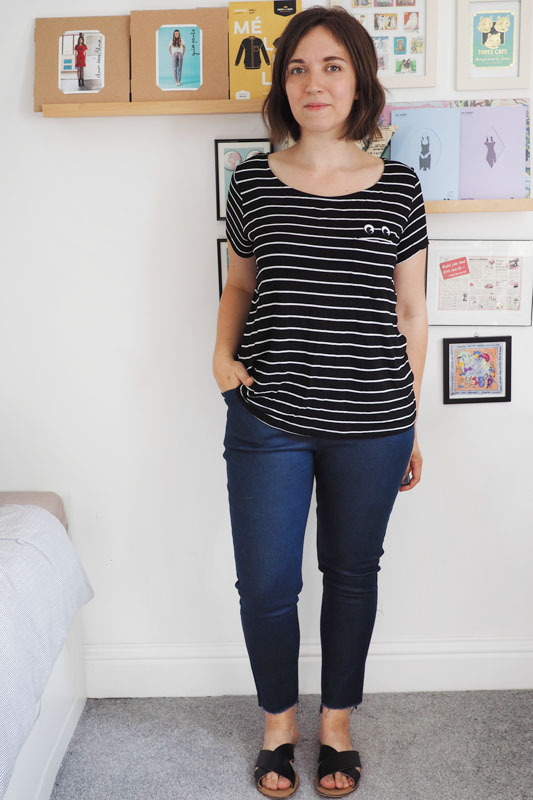 It looks so good with denim (Safran jeans here) and the relaxed shape and dream fabric make it super comfy. Here’s hoping I don’t spill coffee/wine/spaghetti down it too soon… perhaps the real reason I usually stick to dark colours. Thanks again to Megan for sending me the Dove pattern to try! You can pick it up for 20% off until Friday using the code HELLODOVE. Sewing time is short right now and I need guaranteed results, so I’ve been doing quite a few repeat makes of TNT patterns lately. 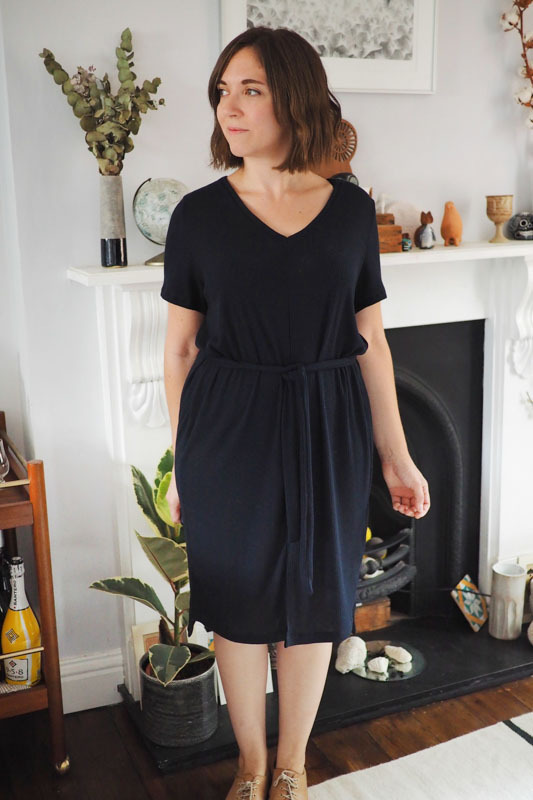 This dress merges the best bits of two of my wardrobe essentials to get another dreamily simple easy-to-wear everyday dress. Guess the two references from my recent makes…? 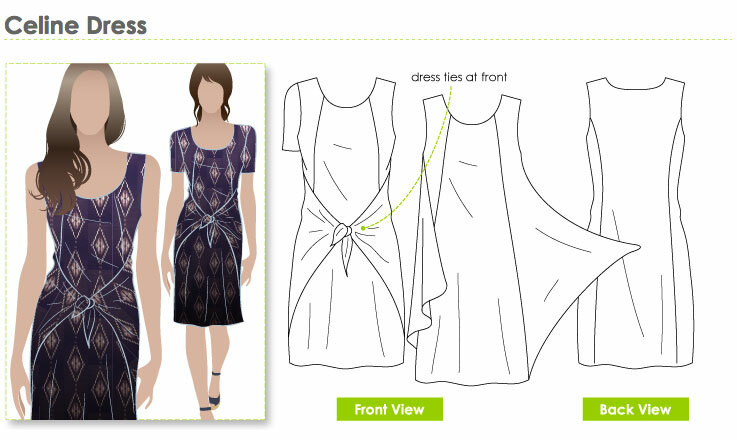 Answer: the base pattern is the Named Inari dress, and the fabric choice and mods were inspired by my Style Arc Celine. I wear one or the other of those weekly (and have made a second stripy Inari already) and now this one’s gone straight into rotation too. 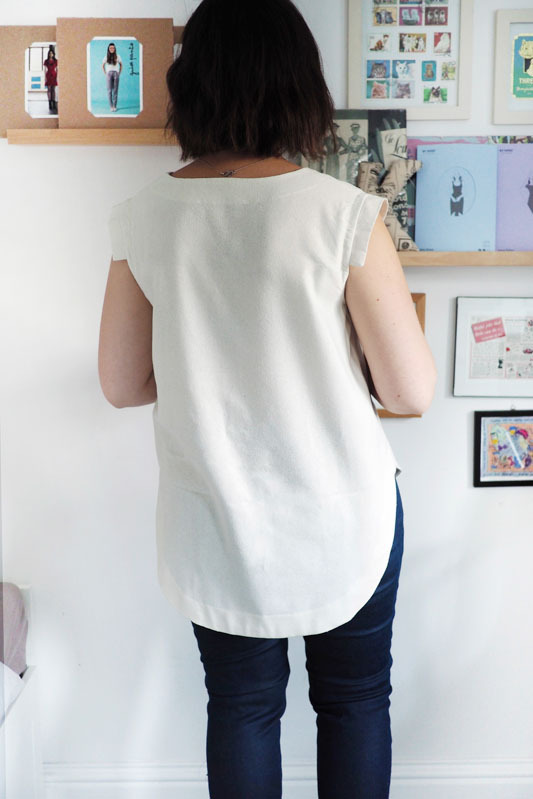 – Freehand convert the round neckline to a V. Tip: cut the V shape in a slightly concave (curving outwards) line rather than straight diagonal: it sits nicer on the upper chest. – The tie is a separate skinny piece, sewn RS together as a tube then turned RS out, the ends tucked in and sewn closed. 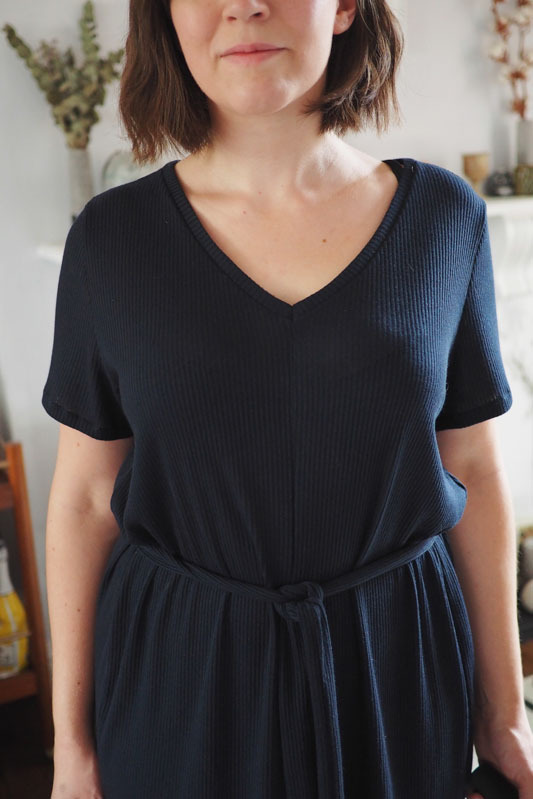 The fabric’s the same as my Celine, cheapo poly-blend rib knit from MyFabrics, but in navy instead of green. The fabric’s held up really well on my Celine, no bobbling/pilling yet despite many washes. I’m going to buy yet more for future variations on this theme. 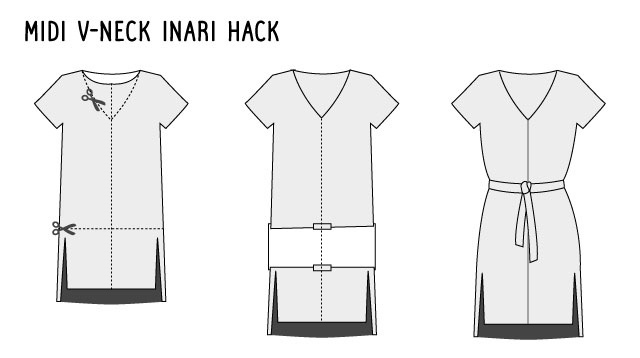 The Inari is designed for either woven or knits, so I didn’t alter the sizing. 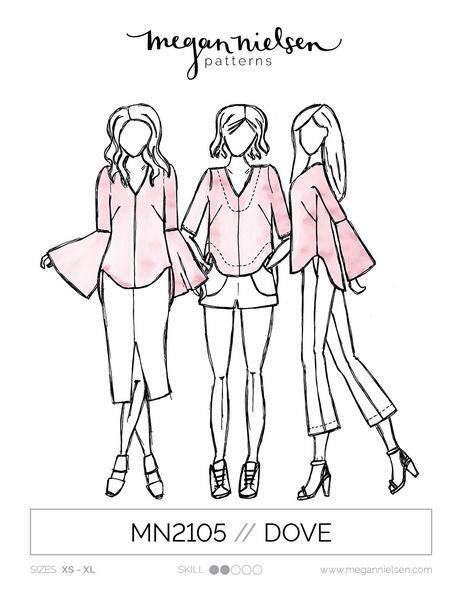 I think the pattern even includes instructions and a pattern piece to do a neckband for knits instead of the facings. I added about 1.5″ onto the sleeve length and left off the bands. One final detail was to leave a small slit at the centre front – easy because of the new CF seam. I was going to level off the hem but decided I quite liked the small extra detail of the stepped hem. I forgot to take a photo without the belt, but it looks pleasingly sack-like and cocoon-y, so it’s really two looks in one. All in all, it’s cycle-friendly, comfy and took like an hour to sew. I need more makes like this in my life right now! Allo! 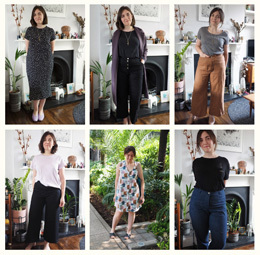 I’ve been on the jeansmaking train again – it’s never too long between denim sessions chez Katie. This time it was external forces guiding me, because Deer and Doe sent over a pre-release of their new Safran jeans and pants sewing pattern to road-test and review. 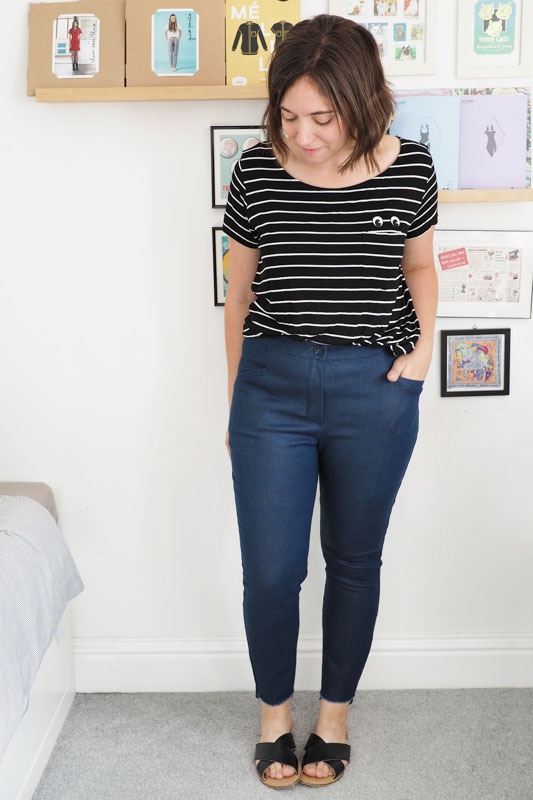 I’ve tried a lot of skinny jeans patterns by this point – Burdas, Style Arcs, Closet Case Files – so how do Safran stack up? 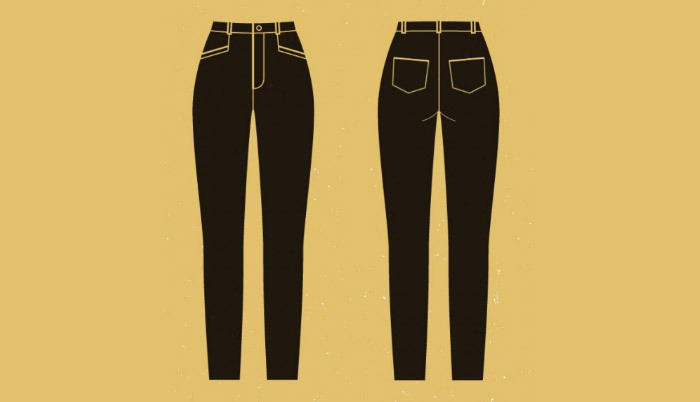 The main difference is that the Safrans are lower on traditional jeans-style details and instead tread the line towards more classic skinny trousers. 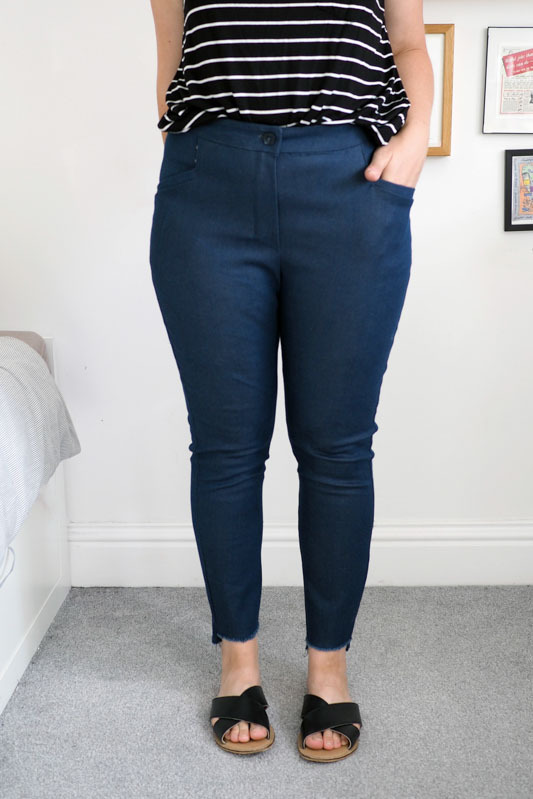 Depending on fabric type you could make quite smart minimal cigarette pants in, say, a black sateen, or go ahead with denim and add plenty of topstitching for more of a jeans look. 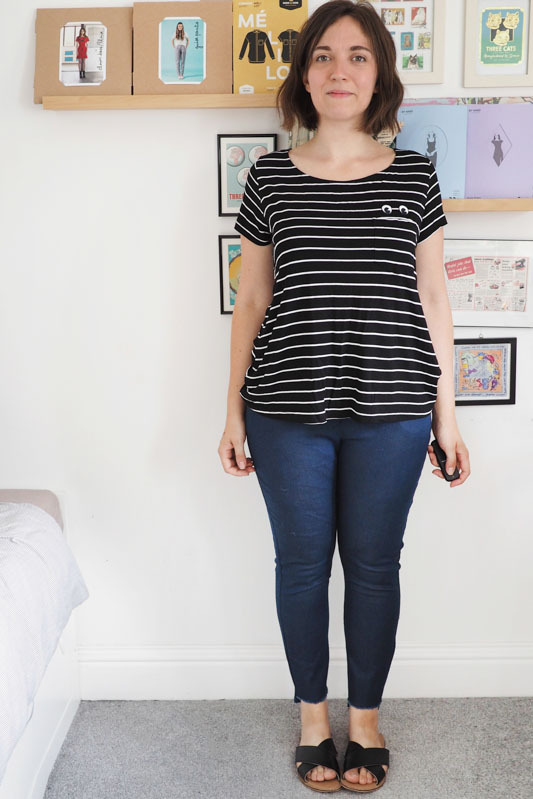 I went down the middle, using a crisp mid-blue denim but without much extra detailing. The pattern comes with two views – A has belt loops, back pockets, a full length leg and instructions for topstitch detailing; B leaves off those details and has a just-above-ankle length. I used mostly view A with the length of view B, however I left the hems raw and staggered them slightly so the back is a bit longer. 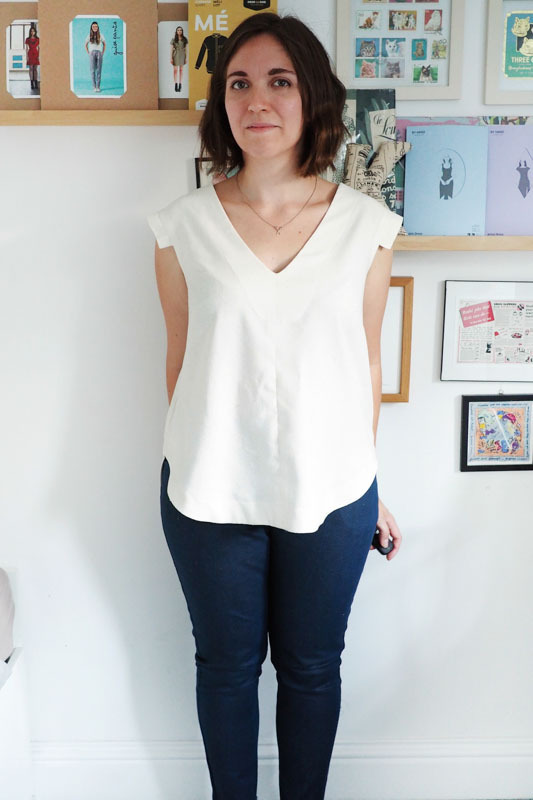 It’s a look I’ve seen in RTW that I like a lot – and hey, no hemming – bonus! 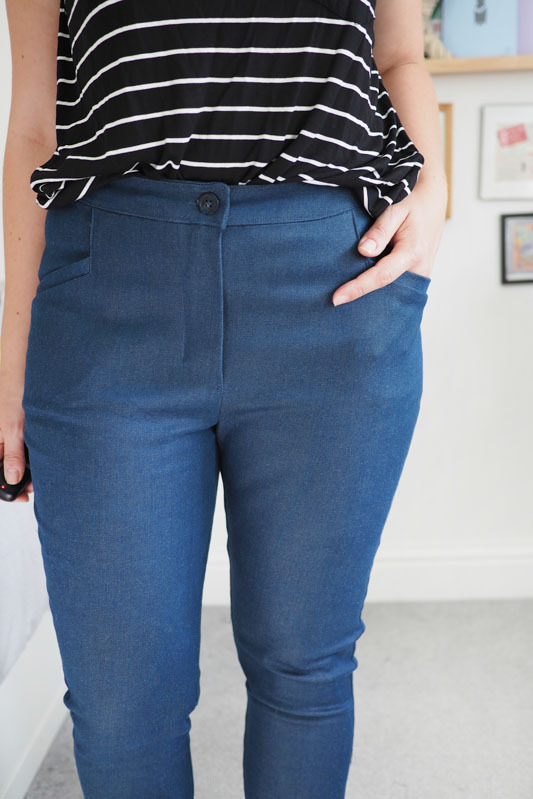 Fabric: You’ll definitely want to heed the fabric recommendations and look for something with 20%+ stretch, because there’s plenty of negative ease factored into the hip measurement. 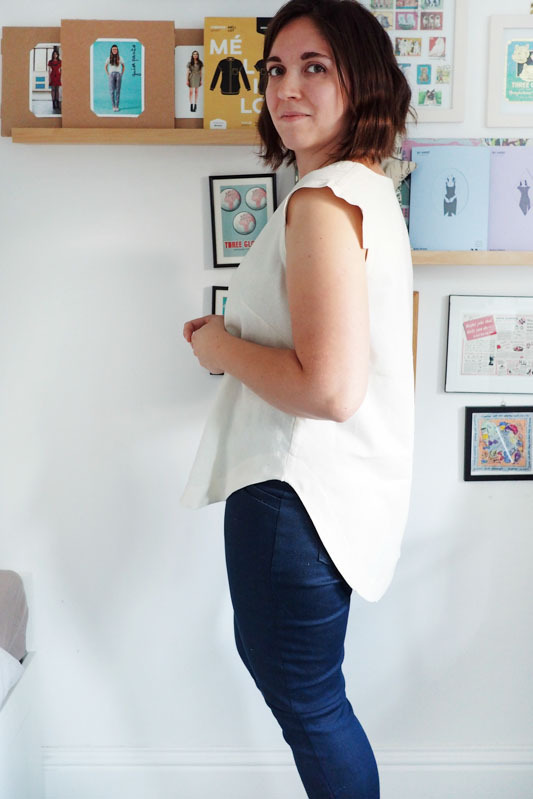 I made a toile in lower stretch denim and while I could just about zip them up, I couldn’t move very far! 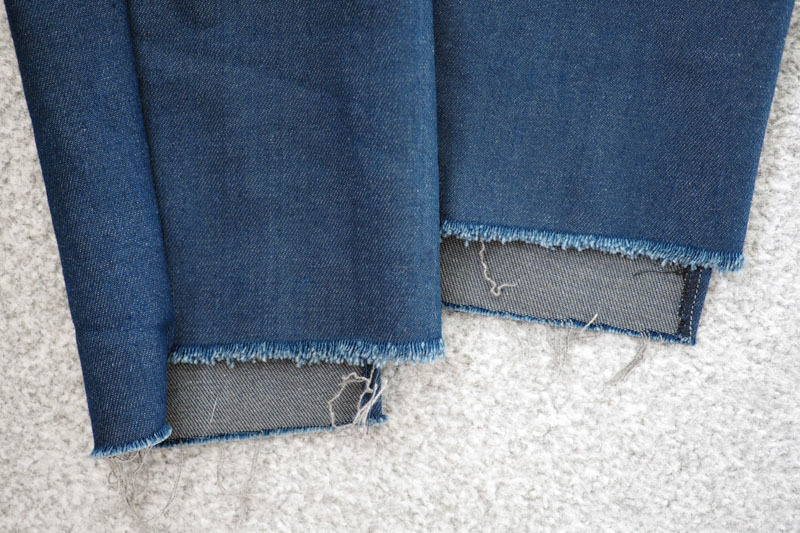 My final denim is medium weight with about 20% stretch, from Woolcrest Textiles. Sizing: I’m a 38/40 in D&D dresses and cut 40 at the waist, 42 at the hip and 38 in the lower leg. 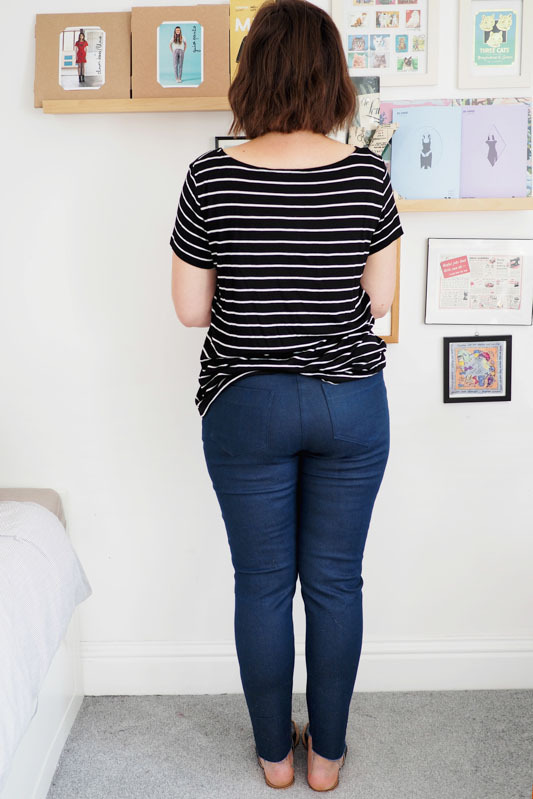 The seam allowances are a generous 5/8″ so you have some fitting wiggle room; I always baste jeans up and try them on before before final sewing as each different denim means the fit will vary a little. I could also probably take a look at a few adjustments around the crotch and knees to fix some of those wrinkles. 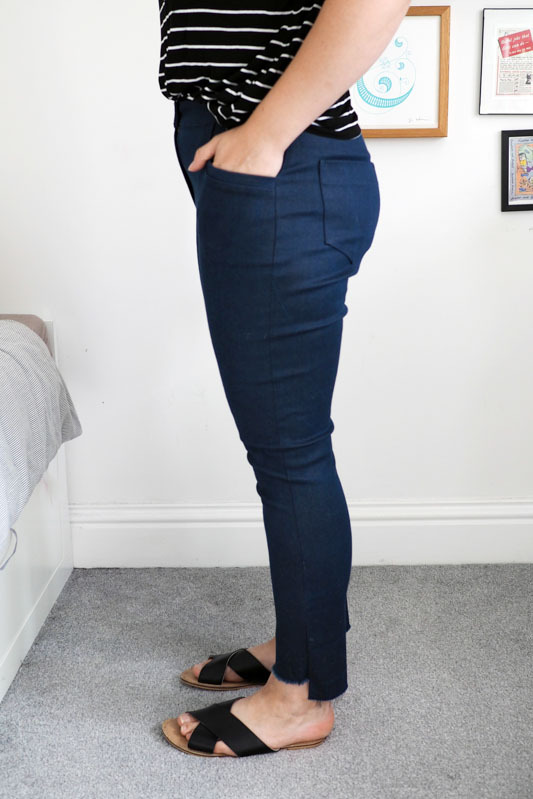 But I really like them proportionally – the rise length is great and there’s a nice curvy waistband that stays put on the low natural waist and doesn’t gape, despite there being no back yoke or darts. 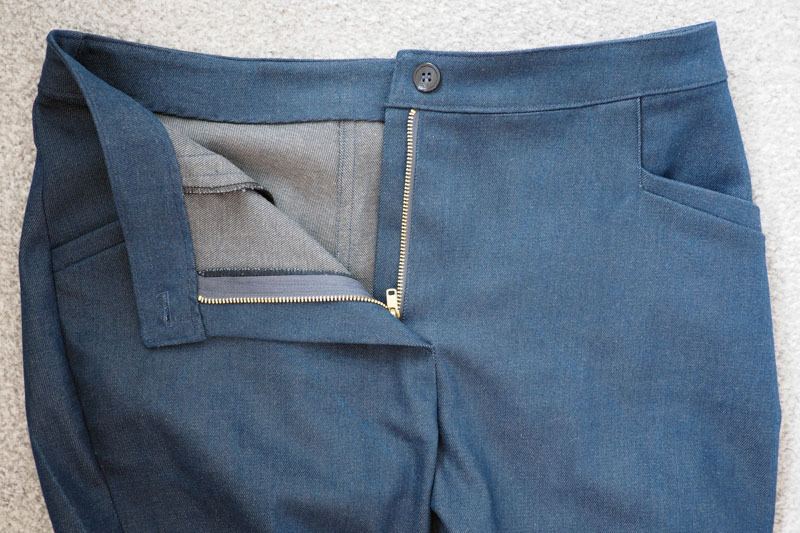 Pockets: The welted slash pockets are a nice detail that are interesting/challenging to sew and actually functionally easier to use than traditional curved jeans pockets. 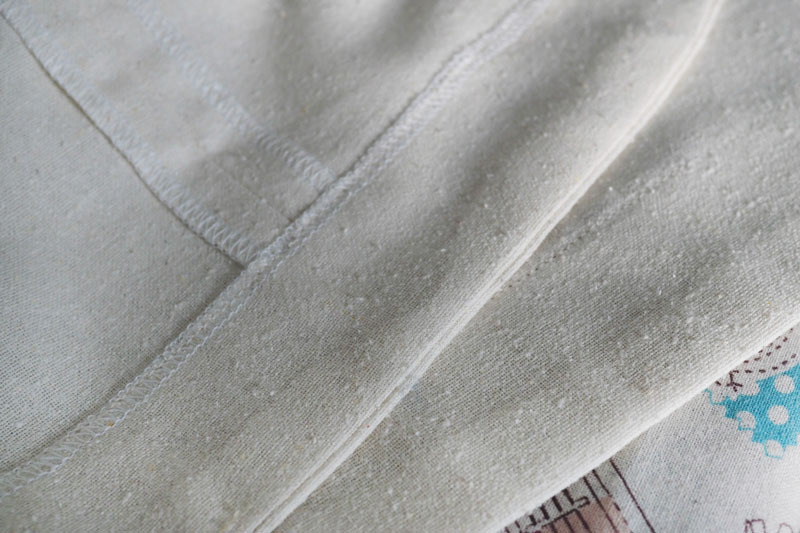 I’d recommend using a pocket lining fabric either with a similar stretch factor to your main fabric, or cutting your pocket lining pieces on the bias so they have some natural give. Using nonstretch cotton for lining can sometimes lead to weird distortion and drag marks, especially if you’re generous of hip like me. Fly: The included fly instructions are different to those I’ve seen before. I tried to follow them on my toile and didn’t like the result much – the zip was only just covered by the overlap – so I deferred back to my favourite Sandra Betzina method. Overall the instructions are clear and detailed but not too hand-holdy, which works for me. There’s lots more details and other tester versions of the Safran pattern on the Deer & Doe blog and they’re planning a series of tutorials and tips. 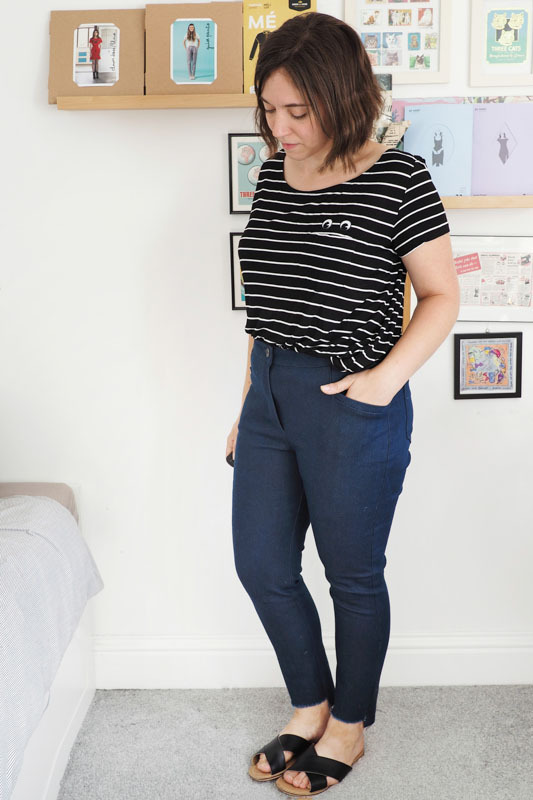 From my point of view, if you like the adaptability of the style go to from jeans to pants, it’s a really nice versatile pattern. Just be sure to get streeeetchy fabric! 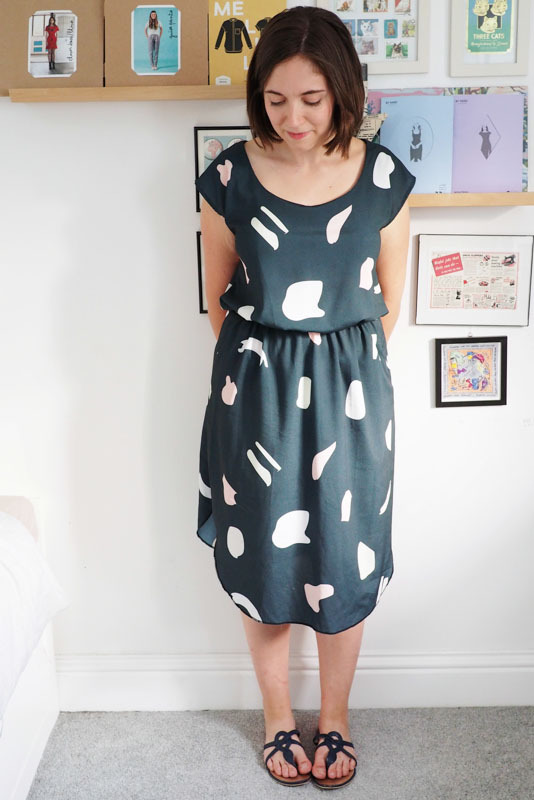 Another recent-ish addition to my summer wardrobe, this is a Style Arc Olivia dress I made a month or so ago. 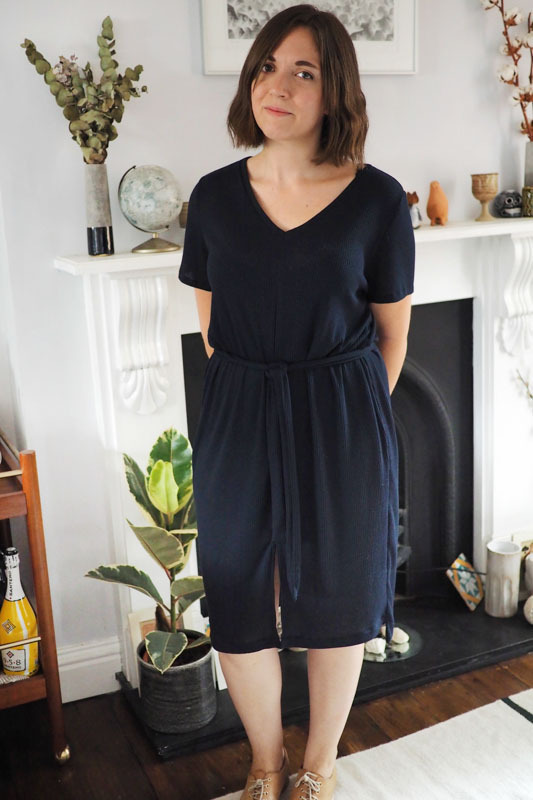 It’s about the simplest project you could imagine with its kimono sleeves, elastic waist and gently flared skirt. I always feel a bit lazy buying patterns like this, but the unfussiness means they actually get used more often than more unique or complex designs, so it’s definitely an economical purchase. It’s also a great canvas for pretty fabrics and ripe for a few design hacks. 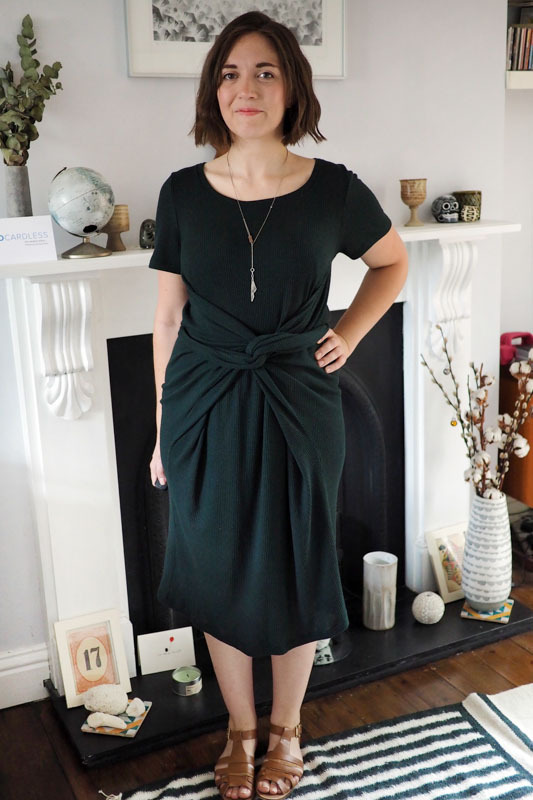 The proportions overall are really nice: I like how the slightly longer bodice blouses over the elastic waist, and the skirt’s the perfect fullness and flare – it’s another cycle-friendly gal. 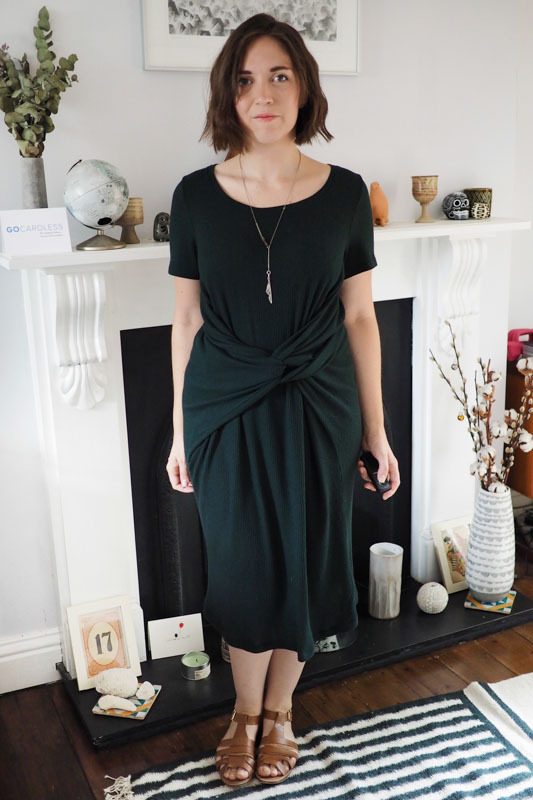 As Meg noted when she made her Olivia, the neckline as drafted is really quite wide and scoopy. I’ve actually got the facings safety-pinned to my bra straps to anchor it in place! Next time I’ll alter the flat pattern to make it a little snugger. 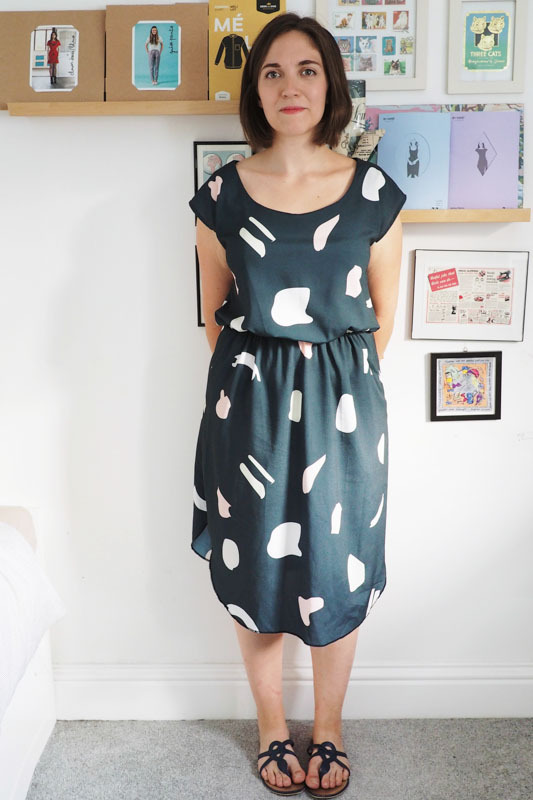 It was the perfect pattern to use my treasured self-designed French crepe fabric, printed by Contrado. Like all springy poly crepes it didn’t like to take a press very well, but it was mercifully non-shifty for cutting and sewing and feels great to wear. I wouldn’t hesitate to get more of their crepes printed with other designs. Considering how fast and simple this was to make, it got INSANE praise when I wore it to work today. I think every girl in the office commented on it, along with gaining boyfriend seal of approval. 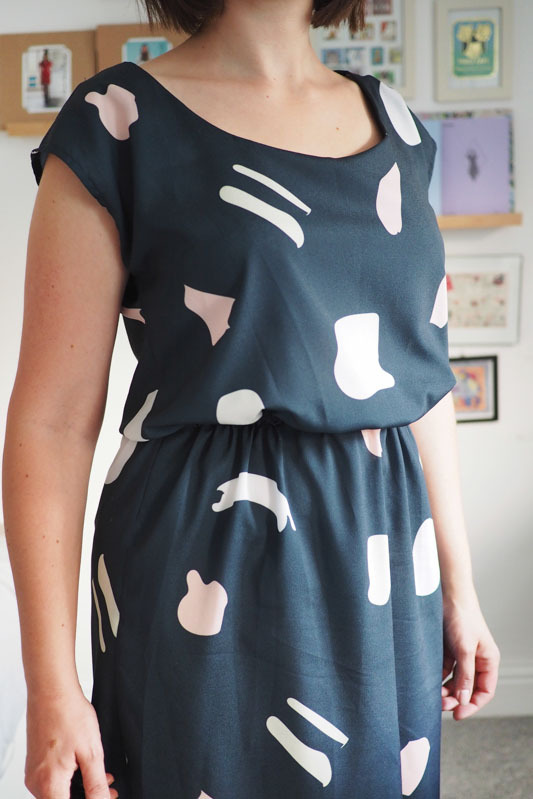 I’d better get designing more fabric and making it into more Olivias! 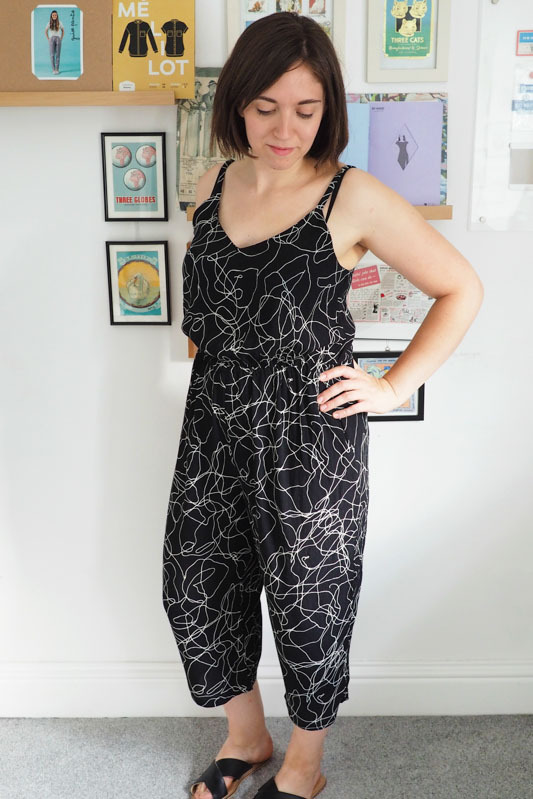 The Summer of Jumpsuits continues – here’s one from a wee vintage pattern from 1981, Style 3304, that I got on eBay with the aim of recreating some of the camisole jumpsuits I’ve been Pinning like this and this. I cut a size 14 but had to take the bodice in a LOT, like 4 inches around the top. I’m not sure how it’d stay up on anyone with the amount of ease built in! 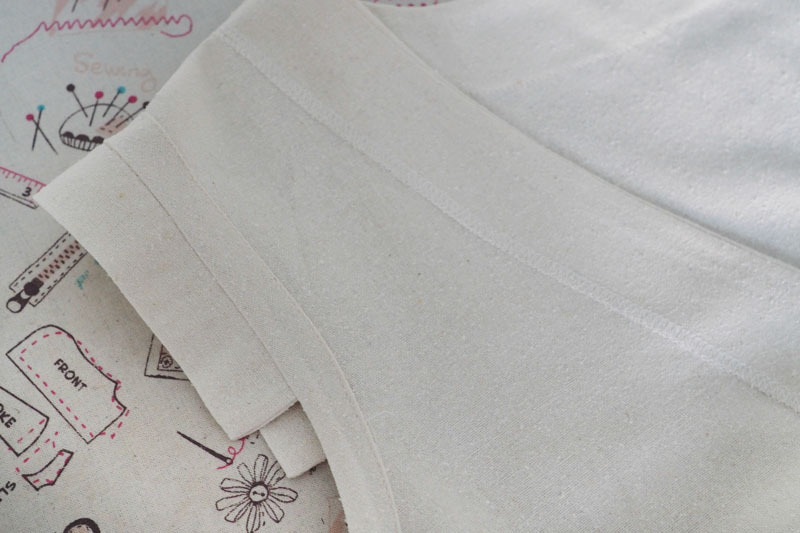 The waistline is formed with an elasticated channel made by the seam allowances being pressed down and topstitched. I did consider leaving it loose and unelasticated like my Marigold but decided to add it here for wardrobe variety. I lopped a good 8 inches off the leg length too. 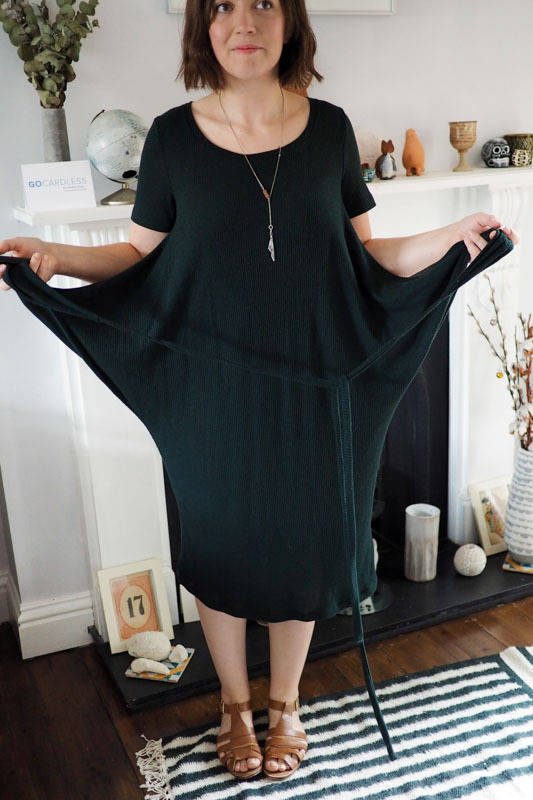 The back is supposed to have a slit and be fastened with a button loop but I added an invisible zip so that I could make it fit snugger – I can’t stand when camisoles droop or gape. Next time I’ll re-cut the pattern down to a 10, the smallest in the packet. This fabric is a rayon crepe from The Fabric Store. 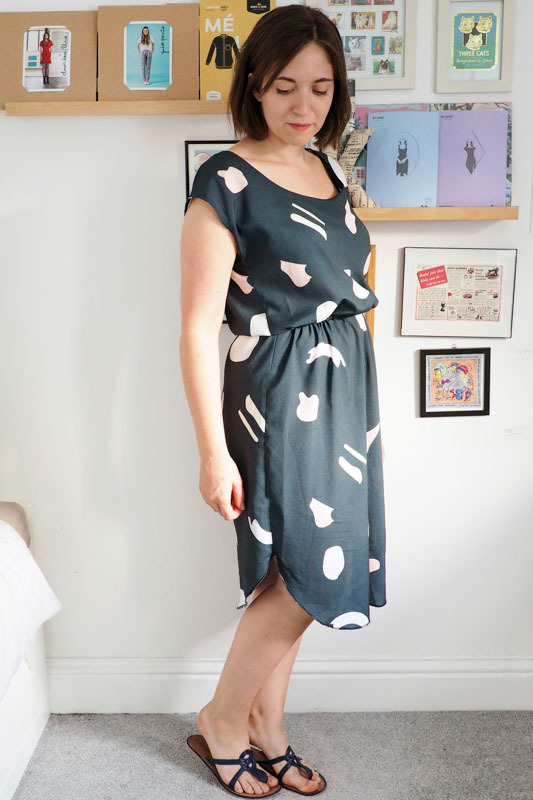 Bit of a backstory here: After admiring The Fabric Store’s range from afar for so long, I finally did an order when there was a free shipping code, buying some baby pink merino, some galaxy printed silk and this rayon. On top of the expensive order I then had to pay a hefty customs charge, but luckily I loved all the fabrics enough to make it worthwhile when I got the package in my paws. Threw them all in a cold/handwash machine prewash together – then nearly burst into tears when I pulled them out and found that this rayon had bled navy ink both into itself, meaning some of the white lines are streaked with pale blue, and worse – all over the lovely powder pink merino jersey, leaving unsalvageable indigo tie-dye all over it. The Fabric Store were amazing about it and kindly sent me both replacement pink jersey and a bonus piece of green too. And after running the rayon through the wash a couple more times with colour catcher sheets I felt that I could use it. I cut around the worst parts of the dye leakage and you can’t really tell from far away that anything’s wrong. Anywaaaay, the rayon crepe was a really nice match for this pattern and while it was a little shifty to deal with I love the result. So, happy ending to that saga. 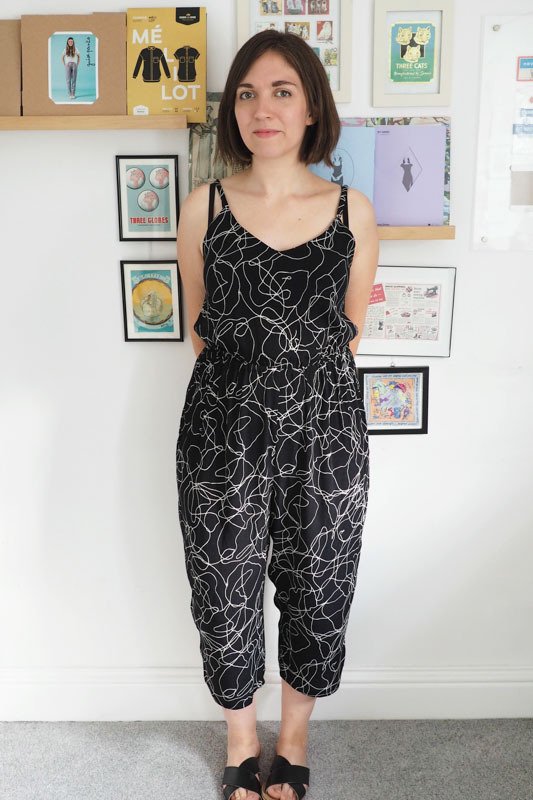 (I should also add in case you were wondering that The Fabric Store are partnering with some bloggers at the moment to send them fabric but that wasn’t the case with me – I paid out of my pocket!). 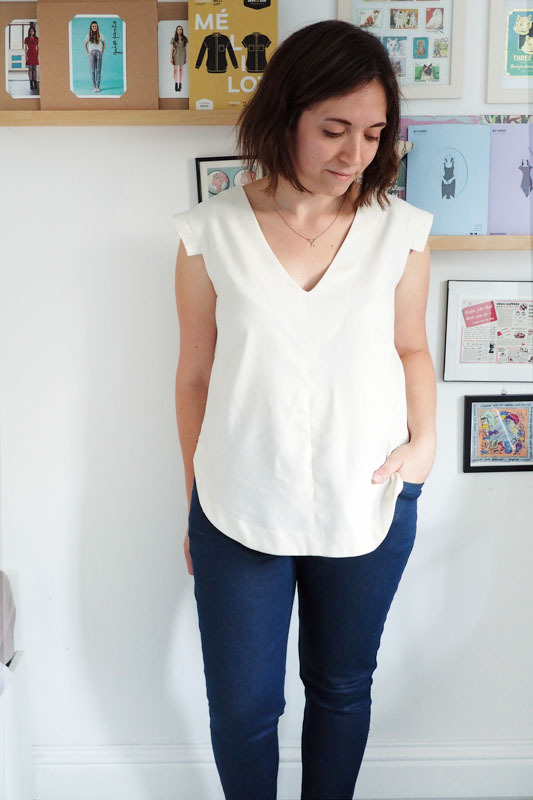 I was considering this a wearbale toile both due to the imperfect fabric and testing a new-to-me pattern, but I’m glad I managed to hack around and end up with a pretty well-made and well-fitting garment. It was great to wear to work during the mini-heatwave a couple of weeks ago, and again works equally well for daytime, cycling and going out. 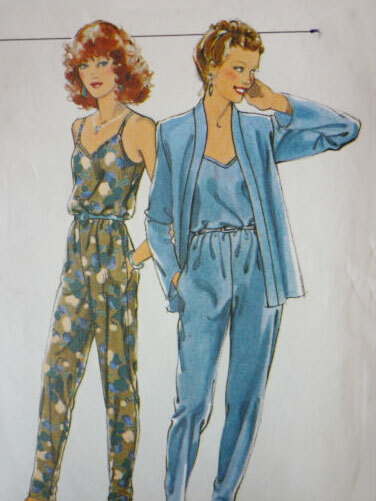 I’m going to alter the bodice of the pattern to try and get the fit bang-on because getting a well-fitting camisole top is like the holy grail for my hollow-upper-chested self, then probably hack it into tops and dresses too. – Two hellish weeks doing jury service. Honestly, if you get asked, run a mile! – Work kicking up a gear, culminating in pretty crazy trip to Iceland. – Lending my camera to my sister because she got a new puppy, and subsequently buying a new one jointly with Josh, which he promptly took on holiday with him. I have managed to fit in a bit of sewing though, if not blogging, so I have a nice backlog of projects to share. Starting with this, my new favourite dress. 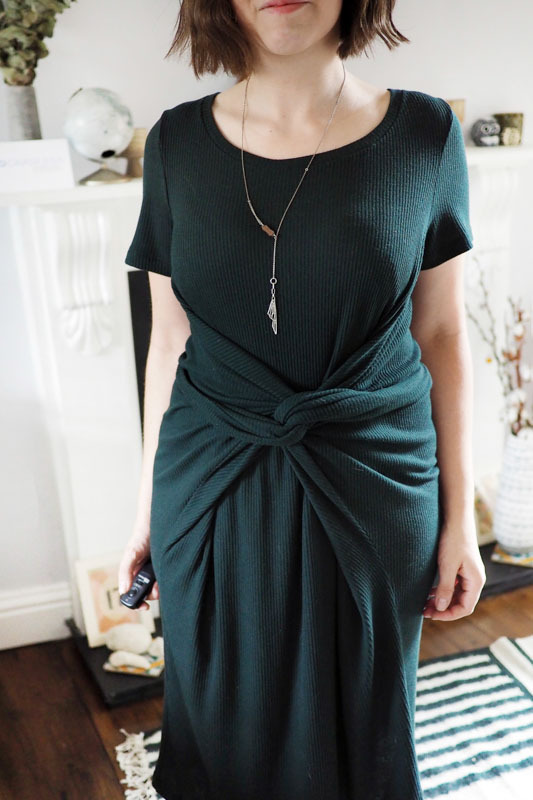 It’s green, it’s midi, it feels like I’m wearing a big comforting hug, and I love it. The basis for the pattern was the Style Arc Celine, though you’d be mistaken for thinking it’s the more famous Named Kielo, especially given the tweaks I made. I bought Celine over Kielo because I know how well Style Arc patterns fit me and they’re so very easy to work with: one pattern on the sheet, nice paper, easy to cut, seam allowances at the ready. Also it came with optional short sleeves which I wanted, though I think Kielo has a free extension pack for sleeves now too. So I basically hacked the Celine to make it look more like Kielo: adding 6 inches to the length and straightening out some of the skirt’s flare; adding extra-long skinny ties onto the wrap sections; and merging the front and back princess-seamed panels into single front and back pieces. (There is some shaping built into the seams, so for a woven I’d use the panels; for a knit I thought it was safe to simply overlap the excess where the princess panels curve outwards.) 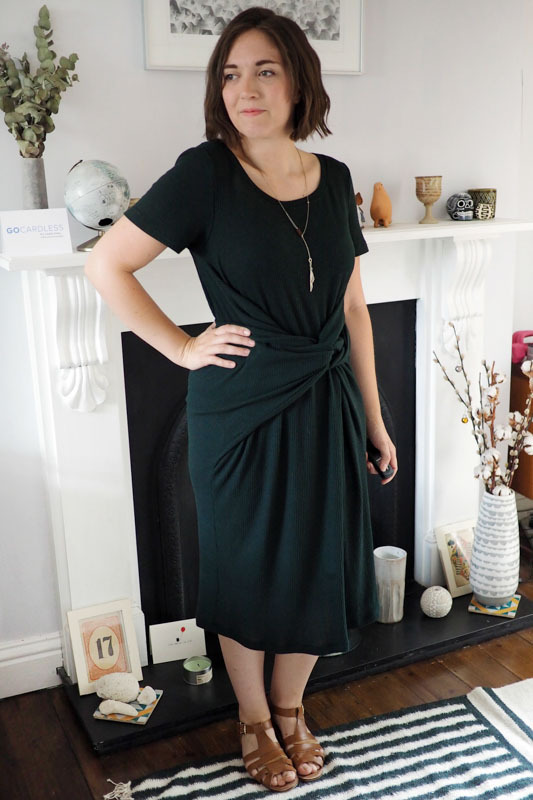 There’s loads of ways to tie the dress to get different looks, but I think the most flattering on me is a crossover at the front with the ties knotted at the back. Knits aren’t amongst the recommended fabrics for Celine, but I didn’t change anything else except switching the neck facing for a band. The fabric is a ribbed knit from MyFabrics. My god this fabric is lovely: yes, it’s polyacrylic, but it’s £3 a metre, snuggly soft, and comes in loads of colours, so I might be snapping up more. It was painfully difficult to cut – my rotary cutter was going NOPE over all the ridges, plus the pattern pieces are huge and awkward so I had to move from my sewing room onto the kitchen floor to have enough space. But once cut it came together quickly and was easy to work with, even the hemming, which I was slightly dreading but came up lovely using a walking foot. 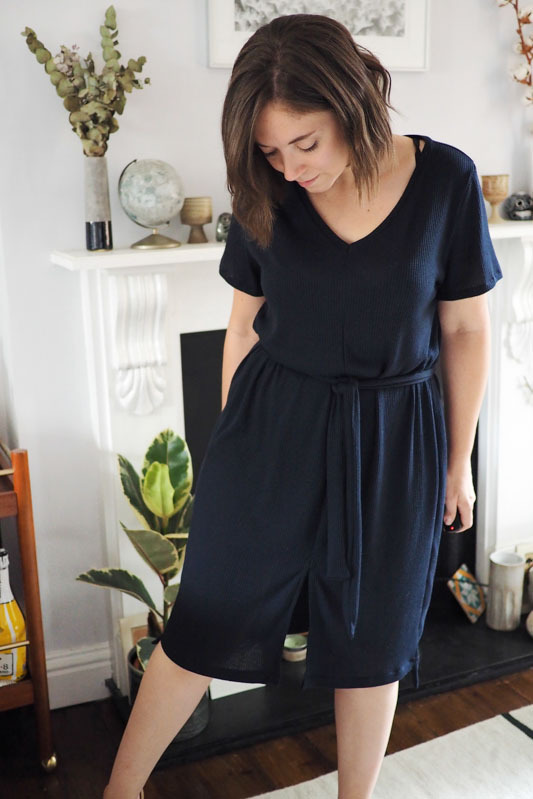 It’s a dress that attracts a lot of comments and compliments, yet it’s secret pyjama comfortable, which is really my preferred criteria for clothing and why it’s amongst my favourite garments right now. I’ve worn it on a flight, to work, it’s cycle friendly, and I’d feel fine wearing it out in the evening too: not many styles you can say that about. Back soon with more! How have you been?